So you’re out in your yard and you come across a pretty flower. Or a fuzzy caterpillar. Or a weird looking bug. And you think, wow, never seen that one before. Cool! But soon there are more. And more. And then that’s all there are. Invasive species. They’re tricky that way. Invasive species, both plants and critters, take the food/water/space that native species need to survive. Some invasives — we’re looking at you, emerald ash borer — leave death and destruction in their wake. 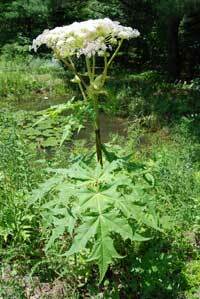 Others — hello, giant hogweed — hurt humans. Actually, all can hurt humans, eventually, because invasive species can change an entire ecosystem, and those changes reach people. Maybe not today. Maybe not tomorrow. But someday. And for a very long time after. The Sun Journal asked experts which invasive species Mainers should be paying attention to, and we narrowed it down to 10. This is not an exhaustive list, but these 10 are among the plants, bugs and animals to look out for. What: A really big, really pretty weed with cool looking white flowers. You will ooh, you will ahh, you will reach out to touch it. Don’t reach out to touch it. Why it’s bad: Its sap can cause burns and blisters when you touch it and then expose that skin to sunlight. Heat and moisture can make things worse. Not so pretty now, huh? Spreads: By seeds. Each plant has thousands of seeds, which can be carried by wind, water, wildlife or humans. Be on the lookout for: Flower umbrellas. No, really. Its clusters of flowers look like umbrellas open over the base of the plant. If spotted: Do. Not. Touch. Report any sighting to the Department of Agriculture, Conservation and Forestry through imapinvasives.org. (Note: If it’s not on your property, reach out to the landowner first.) The department also offers online tips for removal if it’s on your property. What: A rapidly growing water plant that can infest an entire body of water, destroying the ecosystem and making it hard to swim, boat or fish. Where: Maine has six native species of milfoil, but variable and Eurasian milfoils are not among them. Variable milfoil has been found in more than two dozen lakes in Maine, including Lake Auburn. 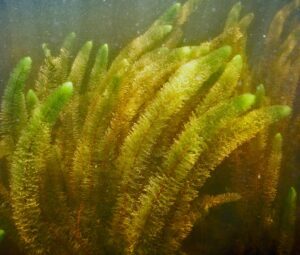 Eurasian milfoil has been found in just three spots in Maine — Pleasant Hill Pond and Grondin Pond in Scarborough and the East Winthrop end of Cobbossee Lake — though inspectors have intercepted it elsewhere, including on a boat going into Pennesseewassee Lake in Norway last summer. Why it’s bad: Lakes and ponds are fun. Invasive milfoil makes lakes and ponds not fun. 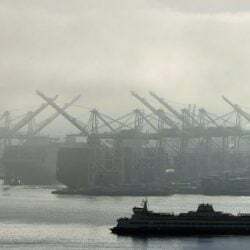 And since swimming, boating and fishing are more difficult in infested waters, waterfront property values can drop, making milfoil an economic problem as well as an ecological and recreational one. Eurasian milfoil, in particular, can be virtually impossible to get rid of once it gets entrenched. Spreads: Typically by boats or gear that accidentally carry plant pieces from infested waters to not-yet-infested waters. A single scrap of milfoil can lead to a full-scale problem. BOLO: Invasive milfoil can be confused for any number of water plants, so it’s best to assume that any plant fragment you carry from the water is a bad plant fragment. (This includes lakes and ponds outside of Maine.) The Maine Department of Environmental Protection urges people to clean, drain and dry their boats, anchor lines and fishing gear before and after they go in the water. What: A big weed that lives in the water. Where: So far it’s been found in Pickerel Pond in Limerick, Damariscotta Lake and its Davis Stream and two private ponds in Woolwich. 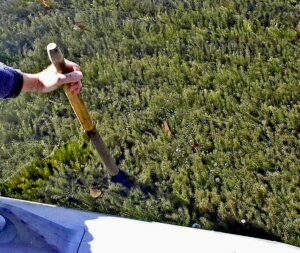 Why it’s bad: Hydrilla can take over an ecosystem quickly and without mercy. You think milfoil is the Big Bad in Maine’s water? Hydrilla is milfoil on steroids. 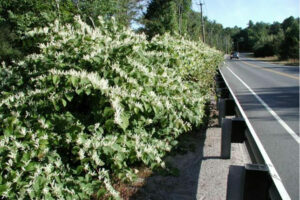 “It’s considered, worldwide, one of the most aggressive, worst-of-the-worst invasive plants,” said Roberta Hill, invasive species program director for Lake Stewards of Maine. Spreads: A lot like milfoil, with pieces inadvertently carried by boaters, fishermen or wildlife. One little piece can lead to a full infestation. 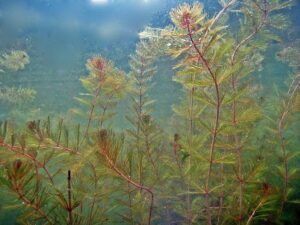 It doesn’t help that hydrilla can survive almost anywhere, including waters with low light, freezing temperatures or little nutrition. 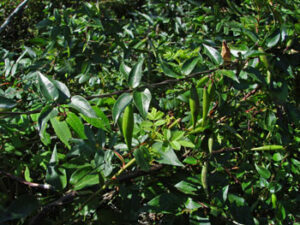 BOLO: Stems and branches with whorls of small leaves that have sharp teeth — it’s really not a nice plant. It can also have tiny white flowers that rise to the water’s surface. But like invasive milfoil, hydrilla can be mistaken for any number of other plants, so it’s best to assume that bit of plant material on your boat is something bad, so get it off before you go somewhere else. 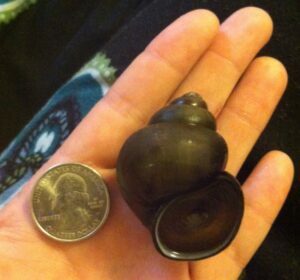 What: A big freshwater snail. Where: They’ve been spotted in dozens of places in Maine, according to an online map put out by the Lake Stewards of Maine. Some are unconfirmed; most are confirmed. A lot of the sightings are clustered around southern and western Maine, including confirmed IDs at Lake Auburn, Sabattus Pond, Upper Range Pond in Poland and Little Wilson Pond in Turner. At least a handful are in Downeast and northern Maine, with one far north as Island Pond in Aroostook County. Why it’s bad: So far, they’re mostly a nuisance. And also? When they die, they smell really bad. But not a lot of studies have been done on the snails, which were first brought to the U.S. as food, so experts worry they could carry dangerous parasites or diseases and take over the food and habitats of native species. 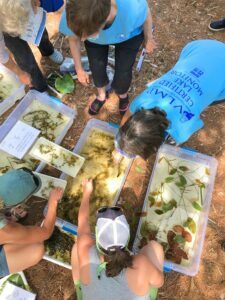 “I’m an ecologist and it’s almost impossible for me to believe an animal of that size that is filling a niche that belonged to our snails, which are much smaller, wouldn’t have an impact on a community. 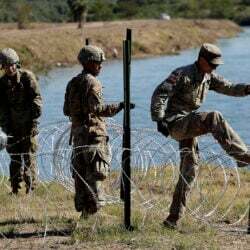 We don’t really know the full impact of them,” Hill said. Spreads: Experts believe they probably hitch rides in bait buckets or in the water holding area of boats. BOLO: They’re olive colored. Also, Maine snails tend to be teeny tiny, so if you see one that’s, say, 50 percent larger — the size of a walnut or golf ball — it’s probably not from around here. If spotted: Reach out to Lake Stewards of Maine at 783-7733 or [email protected] so it can add yours to its sightings database. What: Aggressive plant that grows in dense thickets. Where: Every county in Maine, including spots along the Androscoggin River, Kennebec River and Saco River. It really enjoys growing along rivers (in case you couldn’t guess), roadsides and anywhere that’s moist. Why it’s bad: Japanese knotweed thickets block out sunlight and kill native plants, taking over and disrupting the local ecosystem. The plant grows quickly and aggressively — it’s never happy staying in one place — so it can infiltrate hay fields, clog waterways and grow across recreational trails. Spreads: Little pieces of roots, green stems or seeds are carried by equipment and people, which can quickly lead to a full infestation. They can also be brought to a new property in fill. 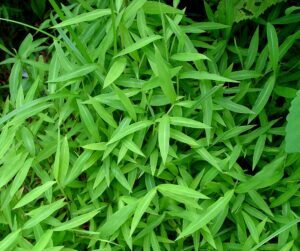 BOLO: Hollow stems (think bamboo) that grow between 3 and 9 feet tall, with wide oval or heart-shaped leaves and small white flowers (in the summer). Its thickets are pretty obvious since they’re so . . . thick. Where: Common in the Casco Bay regions and parts of southern Maine. A sun-loving vine, it blankets hay fields and grasslands. It also climbs up shrubs and small trees. Why it’s bad: The black swallow-wart crowds out native plants. Also, the vines can spell doom for monarch butterflies, who lay eggs on them and figure everything is dandy since the vine is related to milkweed. The problem is, newly hatched caterpillars can’t survive by eating black swallow-wort, so they die. Spreads: Seeds are transported in soil, fill or hay, or carried by the wind. People can also accidentally spread seeds, so hikers and others should clean off their boots before leaving a black swallow-wort area. BOLO: Vines with dark leaves and purplish flowers (in the summer) and green pods that remind you of milkweed. Where: It’s been spotted as close as Connecticut, Massachusetts and New Hampshire, but it’s not in Maine . . . yet. It likes floodplains, forests, fields, thickets and utility corridors, among other places. Why it’s bad: Japanese stilt grass is the invasive plant that scares Olmstead the most. An aggressive invader, it can survive in sun or shade, in moisture or moderately dry conditions, and it colonizes the place once it gets going. “That would just be very destructive if it got into our forests,” she said. Spreads: Seeds are spread by wildlife and humans. Seeds can also hitchhike on out-of-state nursery plants in soil, root balls or on the plant itself. BOLO: Green, lance-shaped grass that tinges purple in the fall. If spotted: Because Japanese stilt grass is of high concern, officials want to know immediately about any possible sightings. Email [email protected] if you think you’ve seen it. 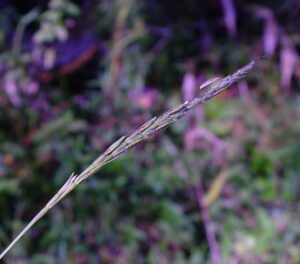 The grass can be difficult to identify, so include photos. 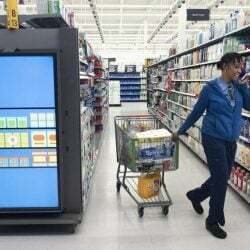 Where: So far, it’s been spotted in two distinct areas of Maine — near the New Hampshire border in York County and in Madawaska, across the river from a Canadian infestation. Why it’s bad: The bugs tunnel through ash trees, killing them within five years. (They’ve killed millions upon millions in North America.) Maine’s ash trees are important for wildlife and the state’s ecology, plus they provide a useful wood. Spreads: The critters can be brought in on out-of-state firewood, which is why that wood has been banned since 2010. Once the beetles are here, their spread can be slowed, but there’s no good way to stop them. “Eventually, it may end up killing a lot of our ash trees,” said Coluzzi, the exotic pest survey coordinator for the Maine Department of Agriculture, Conservation and Forestry. BOLO: They start out looking like little white worms with bell-shaped segments. Adults are small (less than half an inch long), metallic green, bullet-shaped and can fly. So you’d think a flying green bullet would be easy to spot, but infestations tend to go unnoticed until someone sees the signs within the trees: a wavy, snake-like pattern of larvae feeding under the bark; tiny, D-shaped holes; split bark; abnormal sprouts from the roots or trunk; lots of woodpecker activity (since the birds like to eat the larvae). If spotted: The state is asking people to TAKE PICTURES AND MAKE A REPORT. It actually put the request in all caps. Reports can be made online at maine.gov/EAB. Where: They have been reported in 67 towns across 12 counties. 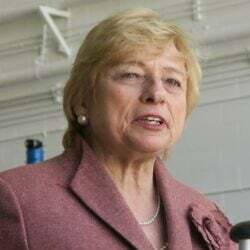 While sightings are more concentrated in southern Maine, there have been verified reports around Androscoggin County (including Lewiston and Auburn), as well as a few verified reports in Norway, Rumford, Mexico and Dixfield. 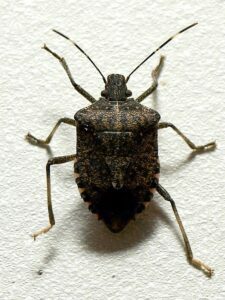 Why it’s bad: The stink bug loves to eat, and it loves to eat crops — including Maine’s beloved corn and fruit. Don’t have any crops? They can still be annoying. The bugs like to spend the winter indoors. In your home. Where you live. “Sometimes the populations build up so high they they kind of freak people out,” Coluzzi said. BOLO: Their light green eggs are often laid on the underside of leaves in the spring. Adults are brown, up to half an inch long and look sort of like they’re armored with tree bark, a natural design that helps them blend in. 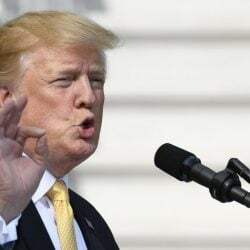 If spotted: The state asks people to take a photo and report any sightings, though it does not need any more reports from Berwick, Biddeford, Brunswick, Gorham, Kennebunk, Kittery, Lewiston, Portland, Saco, Sanford, Scarborough, South Berwick, South Portland, Westbrook and York. If you’re not in one of those towns and you see a stink bug, you can report it here: surveymonkey.com/r/ME2017BMSB. What: A fuzzy white moth that spends the first part of its life as a caterpillar with poisonous hair. Where: Throughout Maine. While they are worst along the coast, browntail moth evidence has been found as far inland as Turner. The moths have been seen all the way west to Kingfield, north to Ashland and east to Topsfield. Why it’s bad: For some people, the caterpillar’s fine hairs can cause a rash when touched or respiratory distress when breathed in. And you don’t have to touch the caterpillar directly. Their hair can remain dangerous for up to three years after the caterpillar has died or molted, so there you are raking up leaves and brush, minding your own business while also stirring up caterpillar hair and, boom, you have a problem. If that wasn’t enough, the caterpillars also feed on hardwood trees, including oak, birch, apple, crab apple and cherry, which can hurt or kill the trees. 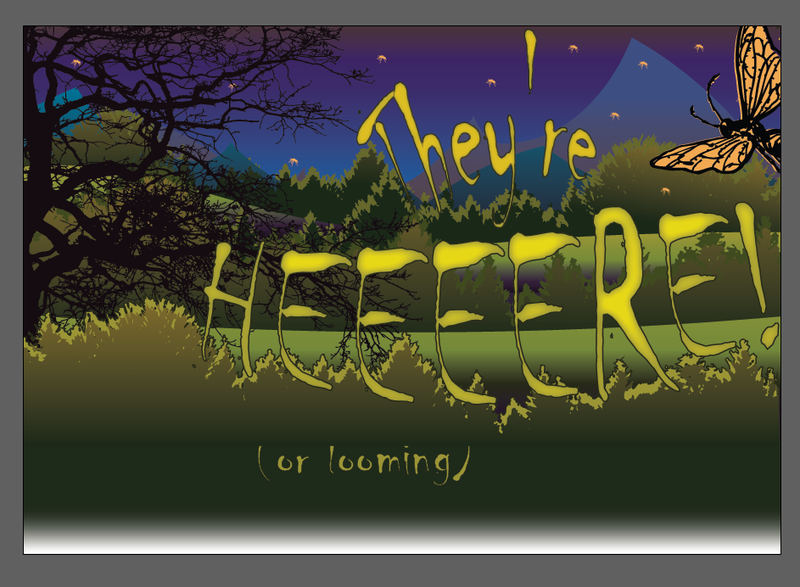 Spreads: Moths lay eggs (200 to 400 per female) on the leaves of trees over the summer. Caterpillars hatch around August and start the cycle all over again. BOLO: Brown caterpillars with white tufts along the side and two red dots near the end. Their winter webs secure tiny brown larvae in trees and can be white silk, 2 to 5 inches long and often placed on the tips of branches. If spotted: Homeowners can clip off low webs before mid-April, put them in soapy water or burn them to prevent caterpillars from emerging. Chemicals can be sprayed before the end of May, but a licensed pesticide applicator should be hired and homeowners should know that hair can still be a problem in the area. To prevent hair from getting on your clothes and sheets, don’t hang laundry outside over the summer. Do take a cool shower and change clothes after raking, mowing the lawn or doing anything else that might lead to contact with the hair. Sightings can be reported by filling out and sending in the state’s citizen scientist survey form found here: maine.gov/dacf/mfs/forest_health/invasive_threats/browntail_moth_info.htm. 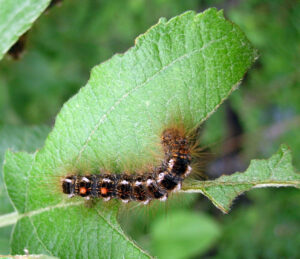 Think something is wrong with your tree but you aren’t sure whether it’s a browntail moth or something else? The state offers a “what is wrong with my tree/shrub/forest report form here: maine.gov/dacf/mfs/forest_health/tree_ailment.html.